Measurement of Corruption thus far, has been limited to measuring perception of Corruption (CPI). This is an indirect measure of Corruption where a sample of population is polled about their perception of the level of Corruption present in a region or service. Since the queries are general and have no reference to specific instances of Corruption, people are more forthcoming and the data is easier to collect. However as the data may or may not be based on ‘self experience’, it is likely to vary wildly between real and imaginary. Also since there is also no correlation between when the bribe was paid and when the question was asked, so the responders are more likely to adjust their responses along expected lines with the passage of time. 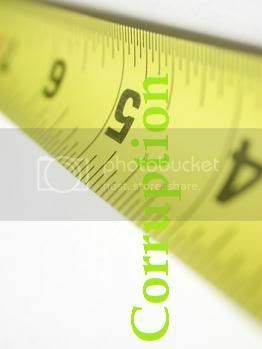 Hence Perception while being an important indicator can not replace direct measurement of Corruption. Direct Measurement of Corruption is a daunting task because of the cloud of secrecy and fear associated with it. The victims fear retaliation and the perpetrators have a vested interest in secrecy, leading to a quiet burial of the incident. So most often, any direct corruption data is difficult to obtain and its also more likely to be intentionally tampered . Yet this is an exercise that needs to be indulged into if only to form one of the several indicators in measuring Corruption. Inflation Model: As Inflation is measured on the basis of prices of a basket of goods and services, similarly a basket of public services that suffer from rampant corruption may be surveyed on a regularly basis to measure Corruption trends. The basket of services may consists of common services like a) Driving License b) Registration of new Company c) New Vehicle Registration d) Registration for Sales Tax e) Passport Application f) Issuance of ‘C’ Forms etc. Survey questionnaire should cover both the cost of obtaining the service (including legal fee, bribes paid and agent commission etc.) as well as the time taken to obtain the services. Those to be surveyed may be chosen randomly from the list of people who recently availed those services (example- A Harvard Study on Corruption in Driving Licenses). Such surveys should should be undertaken at regular intervals across various regions for each of the services in the basket. Data for the same service across various regions should be compared to find out if there are any location specific bottlenecks. The time duration for obtaining the services may act as an alternate indicator of Corruption trends. The collected data should be aggregated over time to yield a Corruption trend. While this model may fall short of giving an indication of the overall quantum of Corruption, it may be useful in determining the trends as well location specific anomalies. Other models for measurement of Corruption may be built around Exit Polls or Confession Boxes. Those who have recently paid bribes or are likely to have paid a bribe, should be encouraged to anonymously disclose their bribes. Exit polling may be attempted discreetly near the places of service delivery. Each of these models would require a lot of tweaking before they deliver credible results. Much of this initiative will have to come from the Private sector with the help of academics, media and corporates to make it work. Measuring corruption is also a lot about collective intent. It will depend upon how serious we are we as a society to uproot this menace. If you’d like to test it, we’ve been collecting data on several aspects of service delivery, such as freedom of information requests or obtaining a business or media credentials, with breakouts of cost and time. We don’t think this is direct measurement of corruption per se, but it’s certainly related. More importantly, these are things that can actually be fixed, unlike “corruption” in it’s more nebulous forms. The Global Integrity Report has downloadable data from 100+ countries that address these questions. Feel free to mix up a spreadsheet and make your own index. I enjoy your site. Keep at it.